One of the movie trailers I saw at the theater last week was for the remake of “Clash of the Titans” – the original is one of my all time favorites. I remember watching it dozens of times on TV throughout my childhood and teen years – after I turned 11 and started cooking and baking, I’d always make something especially for the movie session, and there was an orange cake I’d repeat to exhaustion back then; unfortunately, I never kept the recipe. What a lovely surprise it was for me to find this recipe in one of my old magazines – it is really, really similar to the one I used to make as a girl and brought me such fond memories from those afternoons. Preheat the oven to 180°C/350°; butter a 20x10cm (8x4in) loaf pan* and line with baking paper; butter the paper as well. Place the butter and sugar in the bowl of an electric mixer and beat for 8-10 minutes or until light and creamy. Add the eggs, one at a time, and beat well. Add the flour and baking powder and mix well. Add the milk, orange juice and zest and mix until smooth. Spoon the mixture into the prepared pan and bake for 55 minutes or until golden and cooked when tested with a skewer. Cool completely on a wire rack, then carefully unmold. To make the icing: combine the sugar and orange juice in a small bowl and mix to form a smooth paste. Use a palette knife to spread the orange icing over the cake and top with the zest. This looks absolutely delicious! I have been making all sorts of pound cakes and sweet breads lately... I'm definitely going to test this recipe out!! I'm supper excited for the remake... It looks EPIC! What a nice little riff on the lemon pound cake! A lovely cake, Patricia! Just the right amount of frosting too! goodness, that looks delicious. 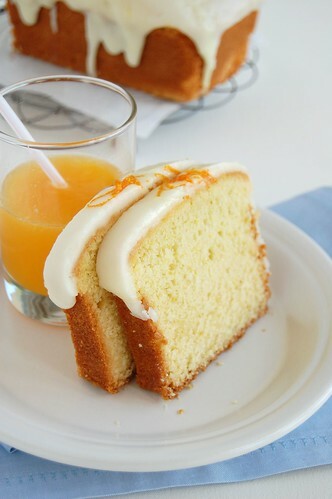 I adore oranges and the thought of orange cake and orange glaze makes my mouth water! I remember seeing this cake in the magazine too! Yours looks picture perfect :) The glaze looks divine! Hi, Jade! Tks for stopping by! Liam Neeson will be playing Zeus!! That is so exciting. Barbara, thank you! I'm glad you like it, sweetie! Wizzy, your cake is absolutely wonderful! Love it! Shauna, tks for visiting! Glad you like the icing! Taranii, thank you! I love oranges, too. Joey, I knew you would, darling! Oh! This looks utterly scrumptious. I love orange in cakes. And your photos, as usual, are such a pleasure, Patricia! Always so gorgeous. Love them . . .
WAY excited! I get to pull mine out of the oven in a few minutes. Didn't have caster sugar so substituted regular granulated. Thanks for the great recipe! Jane, you are always so sweet - thank you, darling! B, that is great news! Thank YOU for coming here and letting me know about the recipe! Hope you enjoy it as much as I did! Family ate it for dessert tonight. I ended up putting the zest for decoration IN the icing. YUMMY!!! Thanks! Wow...I love Clash of the Titans too and was thrilled (I actually screamed a little) when I saw the trailer. And I swear that this is the same orange cake recipe that I made in like grade 8 home ec which was my favorite cake!! Thanks for the reminder and I'll be making this cake this weekend for certain. What a delicious cake this must have been. I'm glad you were able to bring back the food and memories from those days. Like everyone else with an interest in food styling, I've recently fallen in love with everything Donna Hay :). i substituted the butter for vegetable oil , to eliminate saturated fat , it's so nice and bulky . B, that sounds like a wonderful idea - and I'm so glad to hear you all liked the cake, tks for letting me know! Xiaolu, Donna Hay is the best, isn't she? I love her! Anonymous, I'm glad to hear that, tks for letting me know! I have made quite a few of your cake recipes and every one has been amazingly delicious– I love your website!! I baked this cake and it was sort of disappointing. It didn't rise at all & the icing never became a paste– just a soupy glaze. I followed the recipe exactly &, not to brag, but I'm not a terrible cook. I thought it might be because I used the wrong sort of orange juice? Are you meant to use orange juice from a carton or squeezed juice right out of the fruit? I was a bit confused, so could you please clarify as I want to try this cake again!? Thank you! Dear Sophie, thank you for your comment. I'm glad to know you're enjoying the blog! I don't know what could have gone wrong with this recipe - some of my Brazilian readers have had success with it. I used natural, freshly squeezed orange juice. As for the cake, what size of pan did you use? Was the baking powder OK? Let's try to understand the problem together, what do you think? Thank you so much for replying! Sorry mine is so late! Ah, I think the difference was that I used orange juice from a carton, not freshly squeezed! That's why the icing was so runny! Also, I must admit that for the cake, I used freshly squeezed lemon juice...Do you think that would have made a difference? You should do the following: start adding the juice to the confectioners' sugar, little by little, and stir. Check the consistency - you might not need the same amount of juice I used. 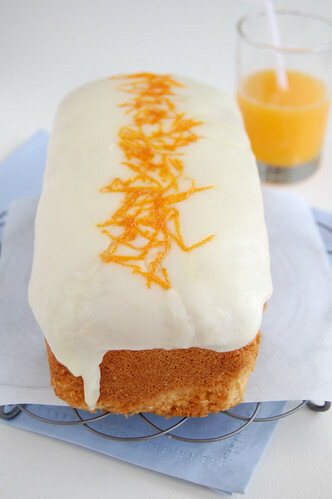 The most fabulous orange loaf recipe ever. I used orange and lemon juice/peel to make a delicious citrus loaf - no need to look further for a better recipe. Scrumptious this is! Thanks Patricia for answering my email queries. Made this this morning on a whim when I came across it and had everything I needed =) It was quite good but a tad dry. I may alter it a bit to fit my taste but overall I was very pleased with it. Thanks! Hey, Shannon, I'm sorry to hear the cake was a bit dry - did you overbake it? Might have a bit ;) My pan might have been a bit bigger than the one you used. I'm not giving up on it yet. I did finish the cake though hehehe. Just made this cake, it turned out very well! Ended up baking it for just about 48 minutes and it is nice and moist, not overdone. Thinned out the glazed just a tad and put it on when the cake was still a bit warm so the glaze could set evenly and run over the edge a little. Hi, Lee! I am so glad to know the recipe worked out fine for you and you liked the cake! Thank you for letting me know! I'm looking through pretty much all your recipes, and this is definitely the one I'm going to try first! I have a food blog too, I'm pretty new so I always check- do you mind if I post your recipes when I try them, always giving links and credit back to you of course?? Of course you can publish the recipes - I have done that with recipe from my favorite food blogs, always linking to them without a problem. I hope you like the cake! I made it and it was delicious! Measures and indications were really perfect. Thank you very much!! Sole Morris, that is great news! Thank YOU for letting me know how the cake turned out!